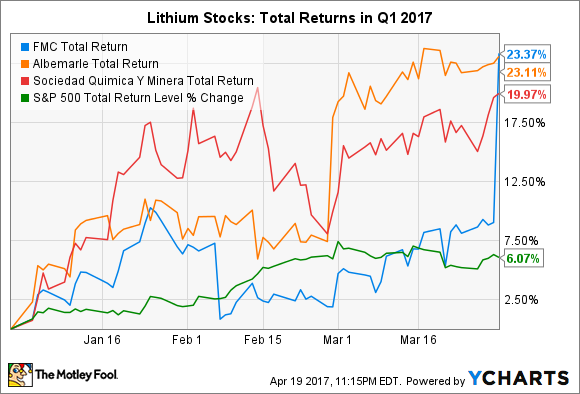 Lithium stocks remained hot in Q1 2017, with the big 3 publicly traded players returning the equivalent of an annual yield of nearly 89%! Lithium stocks' returns in the first quarter of 2017 continued to be powerful. The three largest lithium players listed on a major U.S. stock exchange -- Albemarle Corporation (NYSE:ALB), Sociedad Quimica y Minera de Chile (NYSE:SQM), or SQM, and FMC Corp. (NYSE:FMC) -- returned an average of 22.2% in the quarter, which is equivalent to a scorching annual return of nearly 89%. The S&P 500 returned a historically strong 6.1% in the first quarter, so the group likely got a boost from the strength of the broader market. However, we can attribute the bulk of the lithium stocks' robust performances to the continued strong market for lithium, which is largely being driven (pun intended) by demand for lithium-ion batteries for electric vehicles (EVs). The major catalyst for stock movements in this group -- as with many groups or individual stocks -- in the first quarter of 2017 was naturally the reporting of fourth-quarter and full-year 2016 results, so we're going to home in on our three major lithium companies' reported earnings. FMC, which took the gold in the quarter, had another huge catalyst, which we'll also explore. An electric vehicle charging. Image source: FMC Corp.
FMC's Q4 revenue slid 4% year over year, adjusted earnings per share (EPS) rose 14%, and EPS based on generally accepted accounting principles (GAAP) came in at $0.12, versus a loss of $1.53 in the fourth quarter of 2015. FMC has been restructuring its business, and the adjusted EPS results exclude restructuring charges. Revenue in FMC's lithium business increased just 1% to $70.6 million year over year, accounting for 8.2% of its total revenue of $865.6 million. Earnings in this business, however, soared more than 90% to $21.3 million, thanks to higher lithium prices. The lithium business' operating profit accounted for about 10.5% of total segment operating profit. For 2017, FMC guided for adjusted EPS growth in the range of 13.5% to 27.7%. FMC's stock soared at the very end of the quarter, as the chart above shows, as the market liked the news that the company was acquiring the portion of DuPont's crop protection business that the European Commission ruled it must divest in order to merge with Dow Chemical. In return, DuPont will get FMC's health and nutrition business and $1.2 billion in cash. As for the bigger picture with FMC's stock: It's returned 72.2% over the one-year period through April 27, making it the best-performing of the three lithium stocks and far outpacing the S&P 500's 16.7% return. Along with its peers, it's underperformed the market over the five-year period, but it's left the market in the dust over the 10-year period, returning 319% vs. the market's 98.4%. Albemarle's stock shot up nearly 10% after it released Q4 earnings in late February, as you can see in the top chart. The market reaction wasn't surprising -- not only did the world's largest supplier of lithium beat Wall Street's earnings estimate, it also guided for a rosier 2017 than analysts were expecting. Albemarle's Q4 revenue slipped 3.6% year over year, adjusted EPS declined 19%, and GAAP EPS surged 242%, due to the sale of its Chemetall business. The revenue decline was expected, as it was driven by divestitures. Revenue in Albemarle's lithium business jumped nearly 50% year over year in the quarter to $208.2 million, accounting for nearly 30% of its total revenue of $696.7 million. This increase was driven by a combination of greater sales volume and higher prices. Growth in the lithium business' adjusted EBITDA leaped 56% to $89.1 million, accounting for 47.4% of overall adjusted EBITDA of $187.4 million. For 2017, Albemarle guided for adjusted EPS growth of 12% to 19%. Albemarle's stock has returned 62% over the one-year period and 198% over the 10-year period through April 27. SQM's revenue in the fourth quarter jumped 34.6% year over year and its earnings per American depository receipt (ADR) soared more than 82%. Underlying results were stronger than its earnings suggest since the company entered into an agreement with the U.S. Department of Justice and the Securities and Exchange Commission (SEC) to resolve civil and criminal cases related to the finding that the Chilean company violated the Foreign Corrupt Practices Act. The settlement negatively impacted SQM's quarterly net income by $30.5 million. Revenue in SQM's lithium business rocketed 181% in the quarter to $176.8 million, accounting for 31.9% of its total revenue of $553.8 million. SQM doesn't provide quarterly segment gross profit numbers, but we know that its lithium business accounted for about 55% of the company's total gross profit in 2016. Analysts expect SQM's 2017 earnings to increase 38.7%. SQM's stock has returned 70.4% over the one-year period and 185% over the 10-year period through April 27. Lithium demand rose in 2016 while supplies were tight, which is why prices increased. This dynamic helped to power results for FMC, Albemarle, and SQM -- most especially the latter two companies, as lithium accounts for a relatively small percentage of FMC's total revenue and segment operating income. FMC's stock only "won" the quarter because of enthusiasm over the announced DuPont transactions. 2016 was a Goldilocks year for lithium stocks. It's widely anticipated that lithium demand will continue to grow in 2017 and beyond. However, as SQM noted in its Q4 earnings release, it's "anticipated that new supply will enter the market during the second half of 2017." So, depending upon the strength of demand and the timing that the new projects come on line, it's possible that lithium prices could stabilize or even come down in late 2017 or 2018. The three big lithium players report Q1 2017 earnings in May, so investors should pay attention to what they share about lithium demand and supply in their earnings releases and conference calls. Investors should remember that none of the three big publicly traded lithium players are pure plays, so their stock price performances will be driven by their overall financial performances, not just the performance of their respective lithium businesses.